I was inspired by this look from Jetting to the Wedding via Pinterest and tried it at home. Anytime there is an easy updo, I want to do it. The messy bun is a style I rock on the regular. When I went try this out it wasn’t as quick and easy as I wanted it to be. I have layered hair and there was difficulty pulling all the layers through the hole. In comes the helper, a zip tie. I have spoken about my love for these zip ties before for home projects and now I can say I have used it for hair purposes. Put your hair into a ponytail at the crown of your head. If you have hair like mine, straight and fine, back comb in a c-shape motion on the top and sides of the head. This will give you some volume and not such a pulled back, slick look. Spray your pulled back hair and ponytail with some hair spray before; it will help keep those flyaways contained. 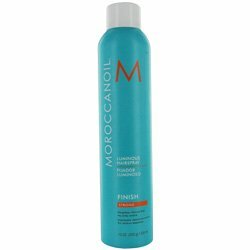 I use Moroccan Oil hairspray, it is light and smells delicious. 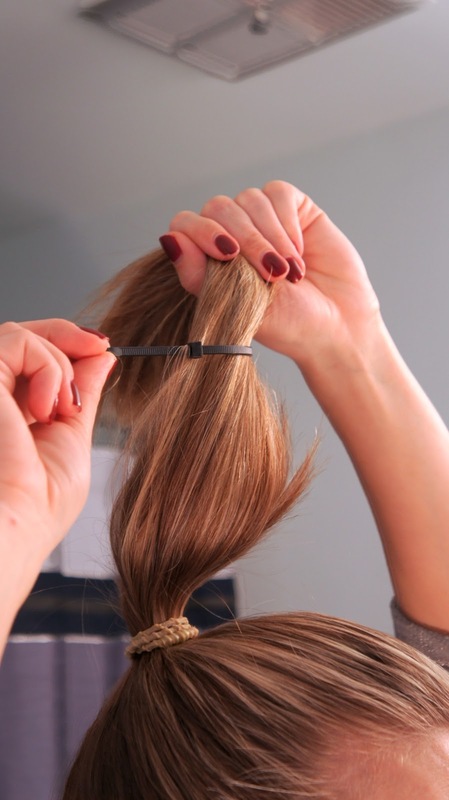 Take the zip tie and pull it so it circles your ponytail. Make sure there is enough room in the loop to fit your fingers. With the pointed end of the zip tie, aim it towards the front center of the pony below the hair elastic. Push the zip tie end through the center until you see it peeping out the back. With your finger, gently make the small hole you created with the zip tie larger to allow all of your hair to pull through. It is easiest if you use your thumb and pointer finger and pull through using the end of the zip tie from the back. To ensure the zip tie does not tighten further, put your finger in the loop as you pull it through. If it does tighten, not a problem, it will come off your hair, but you will not be able to easily reuse it. No big deal, it costs less than five cents. Having layered hair, the bottom piece sticking through doesn’t lay right. You can take the pieces and wrap them around to the front going in both directions. They will be hidden by the mess bump you have just created. Secure with some bobby pins, some hair spray and you are done. To make the bobby pins hold, spray them with hairspray before inserting. You can use both bobby pins and hair pins. Hint- To make sure the bobby pin hold, spray them with hairspray before inserting into hair.